On Sunday and again on Monday Andy and I spent most of the day wandering around Belleville, visiting art studios and galleries during the four-day Belleville Open Studios, which takes place each year around the end of May. I had enjoyed this event in 2011 and 2015, though I had never engaged with it as deeply as we did this year. On Sunday after brunch we walked over to Belleville, getting a map at the first studio we noticed (by its balloons), then wending our way up to the Ateliers d’Artistes de Belleville (AAB) gallery at 1 rue Picabia (M° Couronnes). At the main gallery we looked at samples by each artist and circled the studios we wanted to visit. We had to do this to organize our walk since over one hundred locations are listed, several showing work by half a dozen artists! But we also looked in on all the studios along our route, whether circled or not; we realized that we enjoyed the ones we hadn’t circled about as much as the ones we had, but it was still worth using the selected studios to organize our path. I liked several witty and/or trenchant sculptures by João Ferreira, in a group show in the Crypte de l’Eglise Notre Dame de la Croix, which was also outstanding in 2015. I really liked the realistic Paris paintings of Jean-Christophe Adenis. So much that I would have purchased his painting from the main gallery for 45 euros if it hadn’t already sold. But when we caught up with him in person he asked 200 euros for other works of the same size. Not unreasonable, but I wasn’t quite prepared to spend that much (even though I did the next day for a cute three-dimensional work from another artist). Andy and I both liked the studio of Sophie Herszkowicz. I may actually go back and buy one of her smaller paintings. We ended up getting to nearly all of the circled galleries before running out of time and energy. The project was a very satisfying way to start Andy’s visit. Not only did we see a lot of fascinating art (diluted but not obscured by the inevitable mediocre stuff), but we explored a lively and non-touristy quartier populaire, got to see the insides of many artist studios and apartments, and met some nice and interesting people. It may in fact be the most-non-touristy beginning to any of my guest visits! 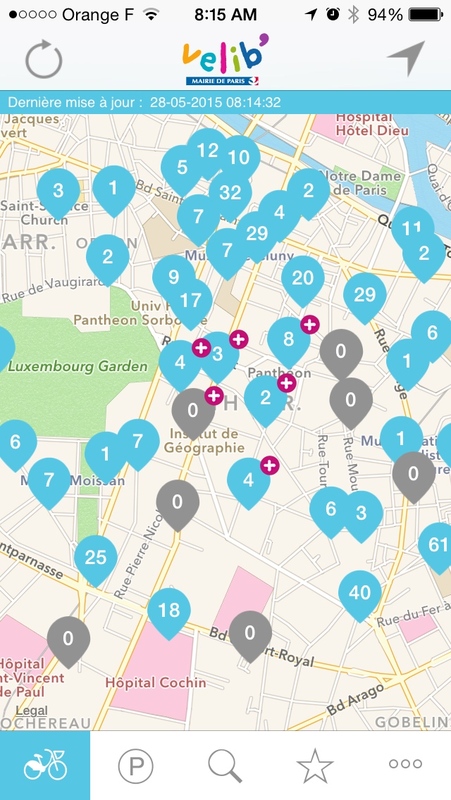 Mot du jour: quartier populaire. Lisa explained earlier in my stay that this means a neighborhood of down to earth folks, i.e. workers, artists, unemployed people and other not-rich citizens. Like Belleville! On Sunday morning I saw Kristoffer off on the Roissybus at Opéra. The ticket machine at the bus stop was broken but he was able to buy a ticket from the driver (since he had prudently saved 11 euros in cash). Paradoxically, you have to stand at a traffic island in the middle of rue de l’Opéra, where the sides are blocked by other buildings, to see the full dome, and the pitched roof over the main theater. This year’s sojourn has been very sociable. A series of old and new friends have stayed with me for several days each: Jared R, Sherard, Omar and Kristoffer, and I’ve spent a lot of time with other visiting friends, including Jared W, Craig and Arturo. As in other years I’ve seen a lot of Zhizhong, and I’ve started catching up with other French friends as well. Earlier in the trip I stayed with Charlie and Markevin near Toulouse and spent a couple of afternoons with Grégory in Bordeaux, not to mention my new Korean friends. This has been great fun, but it has also left me with less alone time than in prior years, and has greatly changed the blogging dynamic. From a discipline that I followed (almost) every evening in 2010 it has become a binge project that gets a week or two behind, then takes me a day or two to catch up! All a long way of saying that it’s different, but quite OK, to now spend a few days alone. Sunday afternoon I headed over to Rosa Bonheur for old time’s sake. The weather has continued to be a mix of sun and rain, but there was a pretty good crowd on the terrasse. I didn’t get into any deep conversations but I did exchange a few nice words with a young woman who was there with her young son and older mother. After finishing my beer I strolled over to the area of little “Villas” to the west of the Park des Buttes Chaumont, which I now see is called la Mouzaïa or the quartier d’Amérique. I added a few shots to my Picasa/Google photo set on la Mouzaïa then continued on to see some of the open studios in an area I had not previously visited, the city of Pré Saint-Gervais, a banlieue! As usual there was a lot of so-so art, but I really liked several pieces by Nausicaa Favart-Amouroux. I also enjoyed a poetry reading accompanied by violin at Un Tapis de Poésie. Pré Saint-Gervais itself seemed to have something of a Turkish tilt, but otherwise seemed quite Parisian and not scary, except for an abandoned building, covered with graffiti. Scary abandoned building covered with grafitti in a banlieue! I had actually encountered a scarier scene earlier within the city limits at Danube. I had a nice Indian dinner at Aarchna, on rue du Télégraph back in Belleville. I was interested to learn that the « télégraph » was actually one of the earliest lines of visual semaphores, which in 1794 allowed a message to be transmitted from Paris to Lille in three hours that previously took three days on horseback. That’s why it was placed on the highest hill in Paris, also why there are now water towers on the same spot. After dinner I walked down rue de Bellevile as the sun went down (around 10 pm!). Here are a few atmospheric pictures from my day as a lone flâneur. All day Monday and Tuesday morning I did literally nothing but catch up on my blog. Enjoy! Mot du jour: banlieue, literally, “suburb,” but many of the inner ring of cities just outside Paris are ethnic, depressed and at times dangerous so in France the term has a sketchy resonance. Wednesday was Sherard’s last day in Paris so we were thrilled the night before to see that the Louvre would reopen! We got up early — for us — and arrived shortly after it opened. Unfortunately, there was already a huge, raucous line. I searched online for a way to jump the queue, and was pleased to discover that the same strategy I had used other years for the Musée D’Orsay also works for the Louvre. In both cases the bottleneck is the security line, but both museums have a much shorter security line for people who already have tickets. You can buy tickets ahead of time on line or at FNAC or many tabacs, but if you wait until the last minute there’s a tabac that sells Louvre tickets right in the underground Carrousel du Louvre where we were waiting. The express security line for people with tickets is up at the glass pyramid so once you have your tickets you go there and sail past the normal security line. I was proud of having worked this dodge but I could see that Sherard was still repelled by the mob scene. I asked which galleries interested him most and when he left it to me I led him to the Mona Lisa, which I assumed he would want to see, even though it attracts the worst sort of paparazzi crowd. After that I spied a few paintings I liked but I could see that Sherard was still not into the experience. Over morning coffee Sherard and I had a heart to heart talk. The upshot was that all he really wanted that day was to buy two items he had seen on earlier walks: (1) a rug he had admired during our walk through the Belleville and Couronnes neighborhoods and (2) a small painting he had liked at a gallery in the Marais. I was proud of Sherard for asserting what he really wanted in the face of the conventional expectation that one has to see the Louvre! We got the hell out of there and headed east. The problem was that neither of us remembered exactly where he had seen the rug, so we retraced our steps: up rue de Belleville, then over to the Parc de Belleville and back down from there. Along the way we saw several pieces of street art that Sherard liked way more than anything he had seen at the musty old Louvre. Just as we were about to give up on the rug, back at the Boulevard de Belleville, I noticed some Muslim stores on rue Jean-Pierre Timbaud, and sure enough, there was the rug! Sherard bought it for a song, and the first of our missions was accomplished. 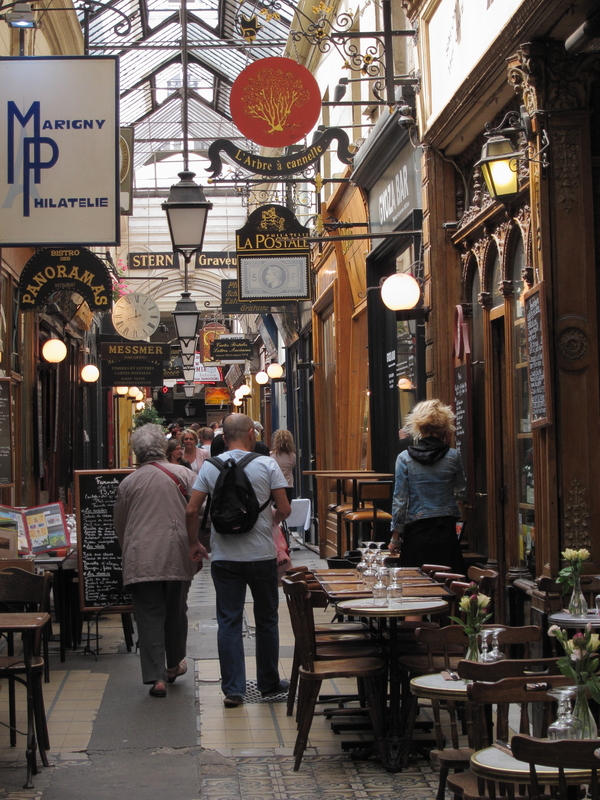 After lunch at the Café de l’Industrie — a sentimental favorite from my first year — we headed over to the Marais. There was a moment of anxiety at the gallery when the painting Sherard liked was no longer on display! But after he asked at the counter the clerk brought out many similar pieces and Sherard left as the happy owner of a colorful semi-abstract portrait. Both missions accomplished, we happily strolled home through the Marais. Sherard suggested that we eat dinner in a completely non-touristy neighborhood we had not yet visited. 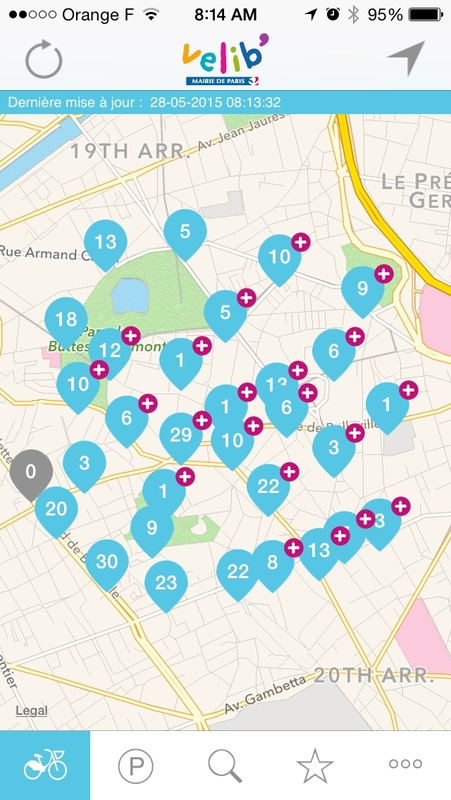 I took a deep breath and proposed Alésia, a typical if unexciting neighborhood in the 14ème arrondissement. I had no specific place in mind so we simply explored. Needless to say, this warmed the cockles of my flâneur heart! The restaurant we settled on, Le Verre Siffleur, turned out to be friendly and rather stylish as well as offering a good meal at a reasonable price. We ended the evening, comme d’habitude, with cocktails at Experimental Cocktail Club. The bartender was charmed when we mentioned our afternoon in Belleville, which she “adores.” But when we mentioned our excursion to Alésia she said, with a visible shudder, that she “never crosses the river.” Just like crossing the Charles River between Boston and Cambridge! Mot du jour: « comme d’habitude », “as usual”. Thwarted by the closings of the the Louvre and the Musée D’Orsay, I promised to take Sherard on Sunday to one of the highest points in Paris, which I guaranteed wouldn’t be affected by the floods. I was right, but … read on. 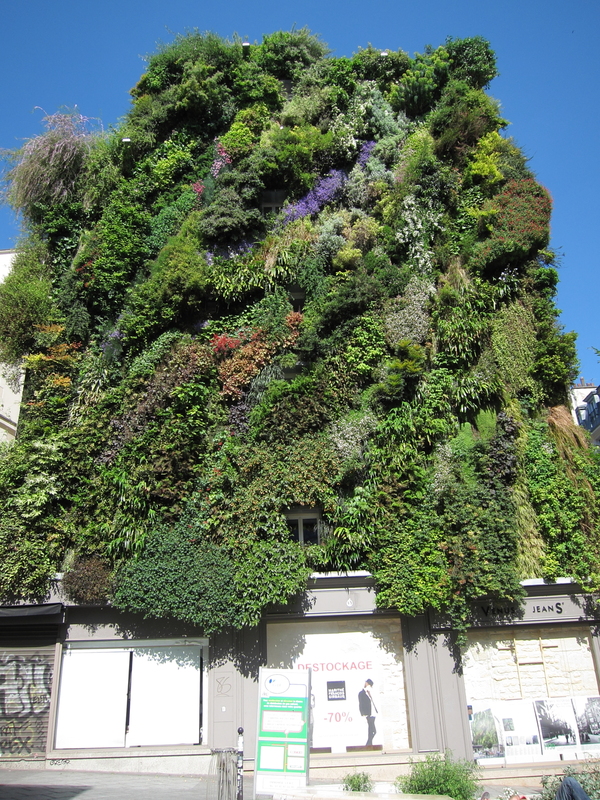 We walked across the Marais — where Sherard saw a small painting he liked — via the Place des Vosges (mentioned in my French Linen post) to the trendy area east of the Place de la Bastille, then over to the Canal Saint-Martin, which was interesting as ever. 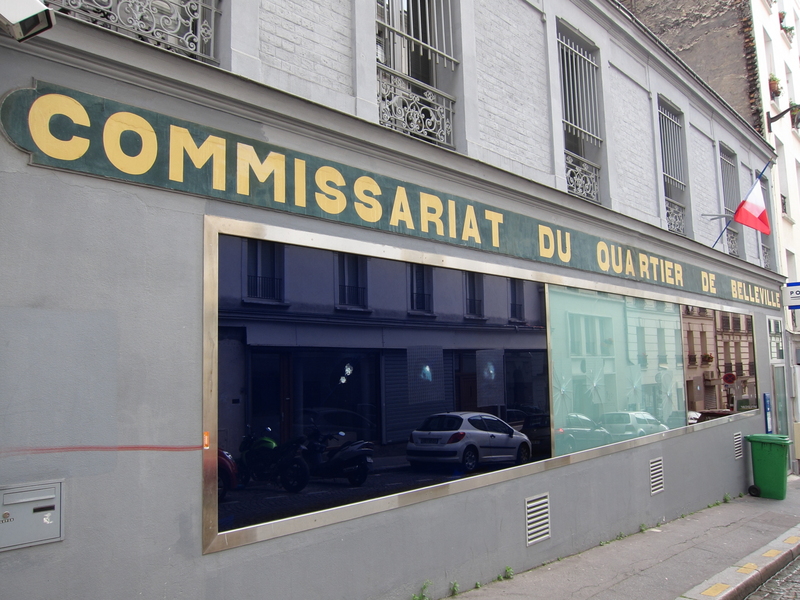 I showed Sherard Comptoir General but realized, seeing it through his eyes, that it was no longer the astonishing art-intensive Ghetto Museum that Alexis had introduced me to several years back, but had become just a big hipster bar with a few bits of African decor. We walked the length of the canal up to Point Ephémère, a hipster bar in part of an old fire station that I had been reading about. We stopped in but it looked too sketchy for our bourgeois tastes. Sad for me since I like to think that a flâneur can appreciate all aspects of the city. There was a leftist political rally of some sort on the plaza between the canal and the Basin de la Villette. We stuck our heads in but it wasn’t our scene either. Not having had much luck thus far I directed our steps to my ace-in-the-hole, the Parc des Buttes-Chaumont, which never fails to charm. Imagine my chagrin when it too was closed! Not of course due to flooding — it’s one of the highest places in Paris! But it seems that the rains that preceded and caused the flood had soaked the soil and rendered certain trees unstable. There was a sign at the main entrance, however, saying that one of the ginguettes in the park was still open, accessible presumably by a safe route. There was no mention of my primary destination, Rosa Bonheur (which usually has a terrific gay scene on Sunday afternoons) but since it was close to an entrance at the top of the park I hoped it might be open as well. I checked its website and phone message and there was no mention of it being closed so we walked up along the outside of the park to the highest point, where a sign informed us that Rosa was closed. We got a quick bite at a restaurant across the street, where our only cold comfort was schadenfreude as we watched families and gay guys come up to the locked gate to discover — as we had — that both the park and Rosa were closed. Our luck turned at this point, however, as Sherard enjoyed the little pedestrian “Villas” off rue de Mouzaïa, which led us up to the completely non-touristy Parc de la Butte du Chapeau Rouge, with a commanding view of the northern suburbs. We walked back via the Parc de Belleville, and Sherard really enjoyed that area, especially appreciating a rug in a Muslim shop we passed by at some point in our meanderings. That evening we had a late dinner at an old favorite, La Bocca on rue Montmartre. 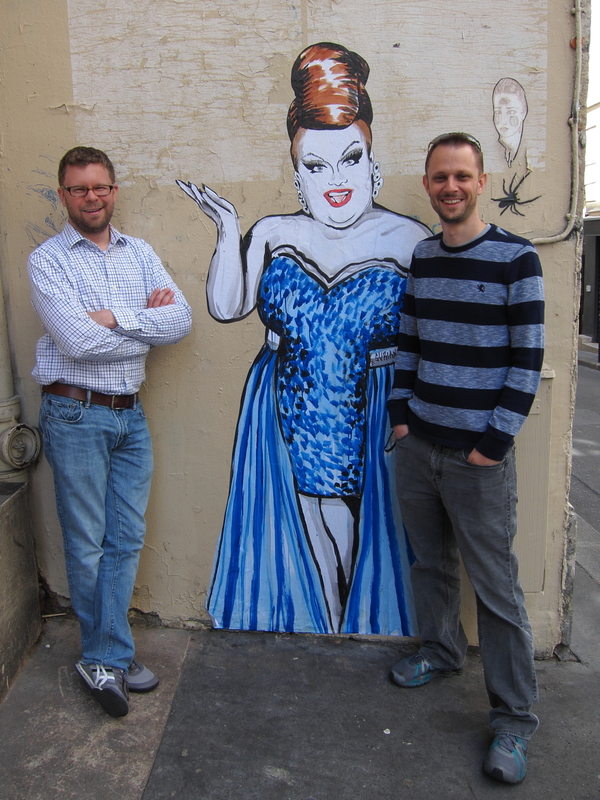 Matt and Chris are born flâneurs. 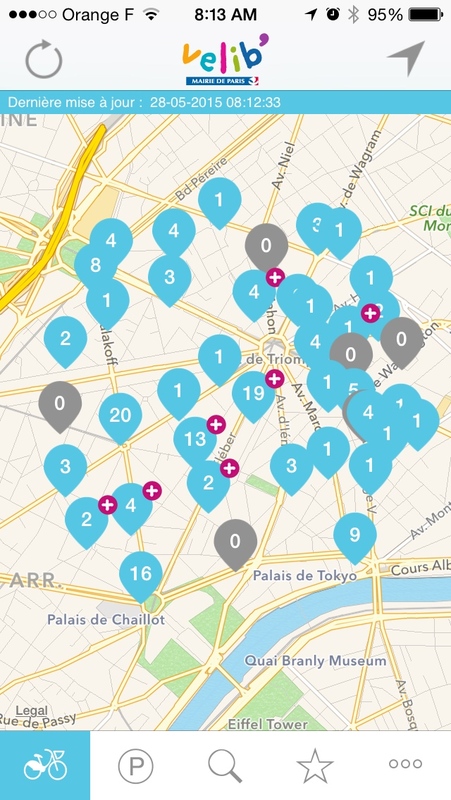 Though this is their first time in Paris they feel absolutely no need to check off tourist sites. Instead they are atttracted by every little alley and stairway. “Where does that go?” They are insatiably curious! This, needless to say, suits me down to the ground. I enjoy nudging them towards interesting places, and pointing out features that they might have missed. But just as often they have suggested unfamiliar routes that have opened my eyes to something new. Walking with them has reawakened my love of Paris, which had dozed a bit this year before they arrived. This post is a collection of photos and stories from our first week of wandering together. During my first two weeks I had always turned left on rue des Jeûneurs or gone straight ahead whenever I left my apartment door. Those directions lead to the Montorgueil shopping district and the Grands Boulevards, while the only thing I knew of in the other direction was a straight nightclub, Silencio. When Matt suggested that we turn right I realized that I had never been that way in daytime. 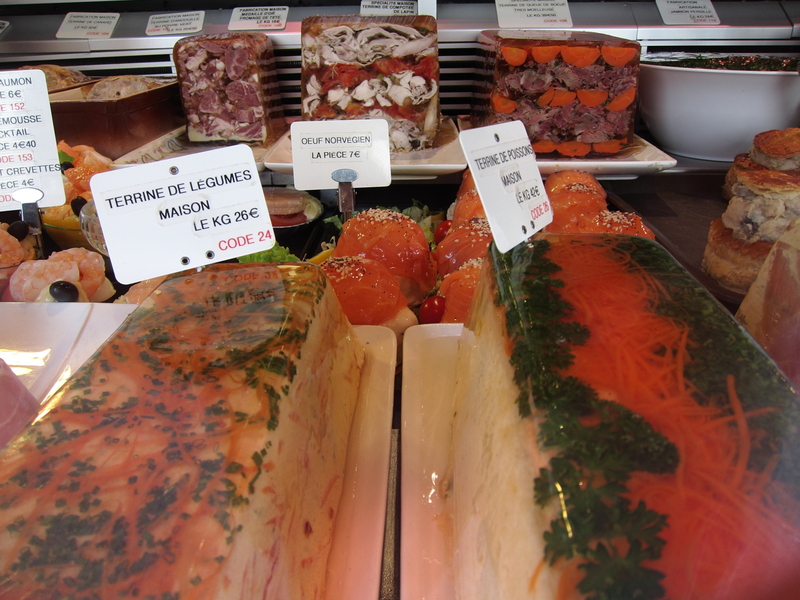 We discovered three cute local lunch places, serving office workers and graduate-level students rather than the bobos of rue Montorgueil. We ate lunch in this place and I plan to try the other two after Matt and Chris go home. 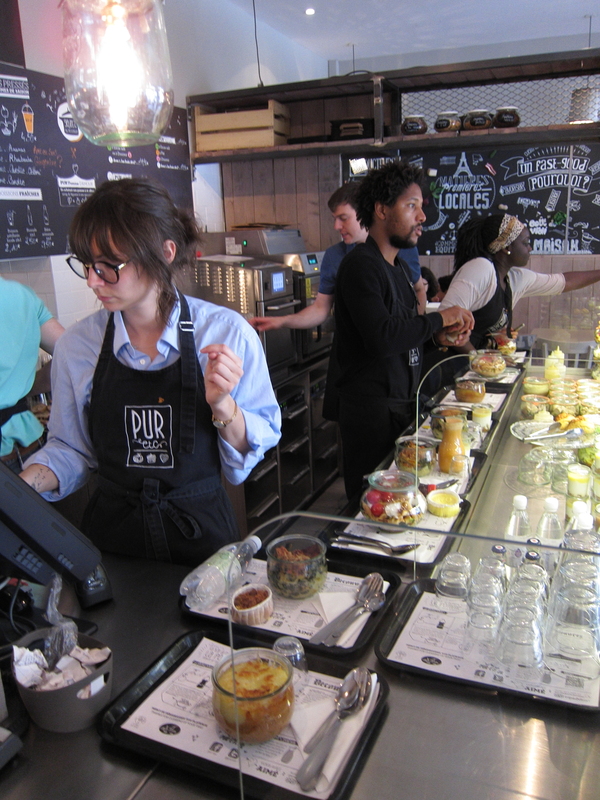 Lunch hour rush at Pur, on rue des Jeûneurs. This scene was in lower Belleville. It looked like something from a war zone. We couldn’t tell whether it was an accident or arson, but we found it astounding that there was no police tape or indeed any indication that anyone was even aware of what must have been quite a conflagration. 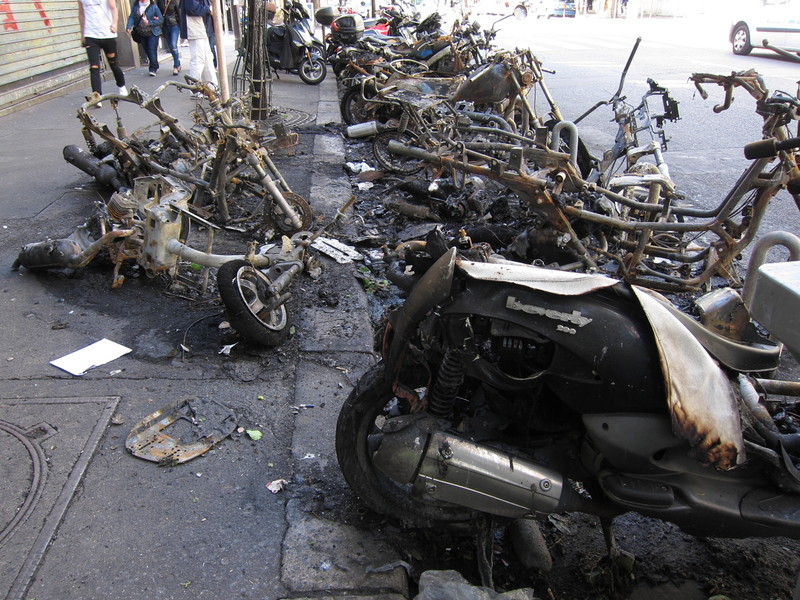 A bunch of incinerated motor bikes. 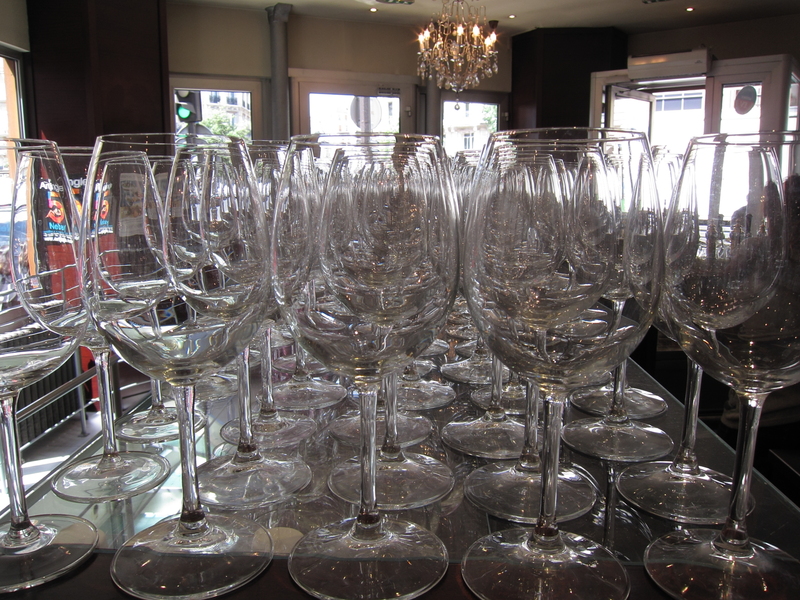 Glassware in Café Le Baron in the 9e. 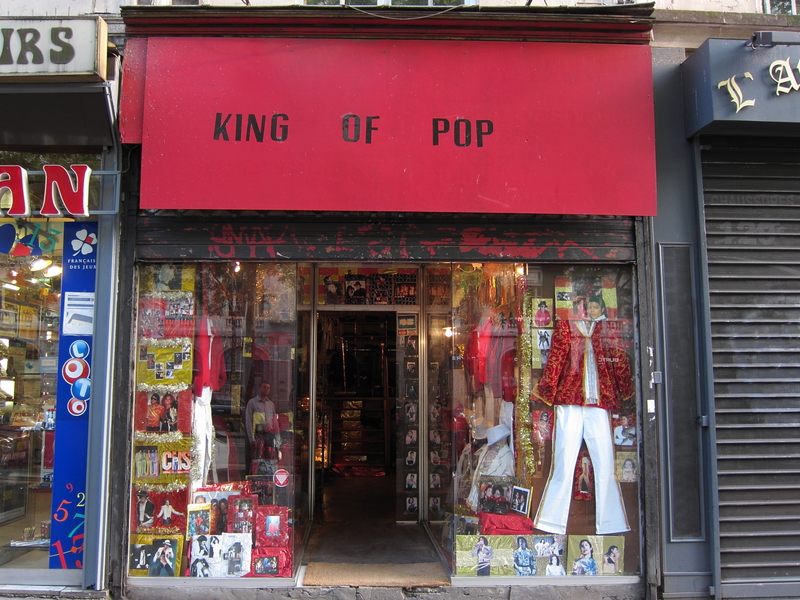 Perfect if you’re into Michael Jackson memorabilia. 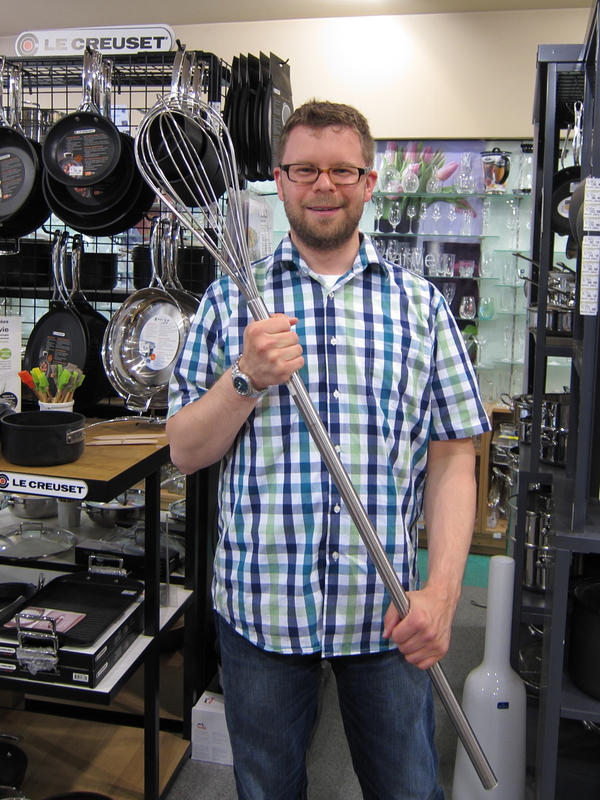 Chris with an enormous whisk in an industrial cookware shop on rue Montmartre. 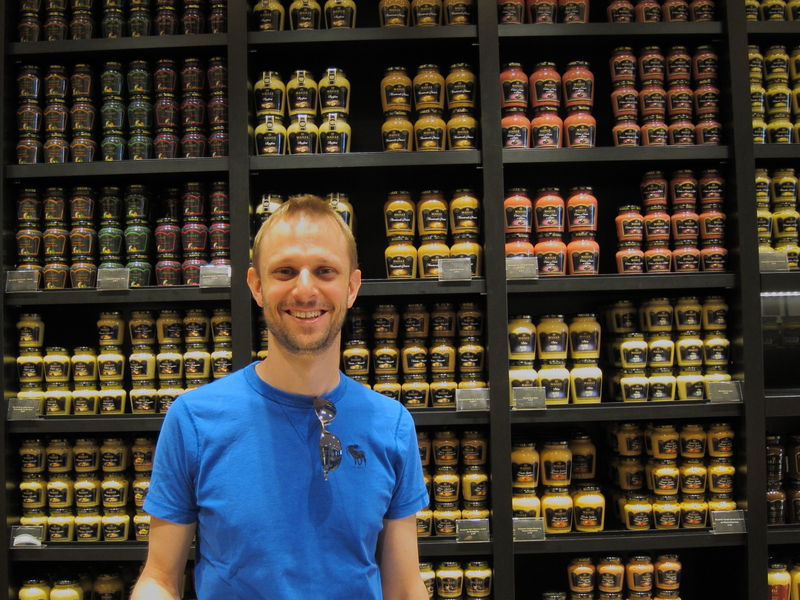 Matt in mustard heaven, at the Maille shop at Place de la Madeleine. 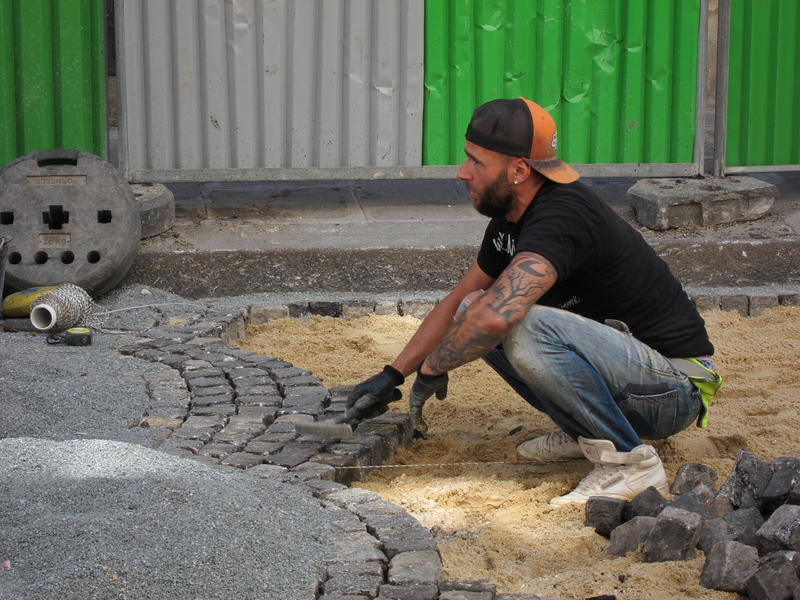 The first time I’ve seen a cobblestone street being laid down, near Étoile. This replaces an earlier version that had been partly blacktopped. We’ve encountered various model shoots and movie teams. This fellow gave us the best photo op. A photo shoot in posh Parc Monceau. 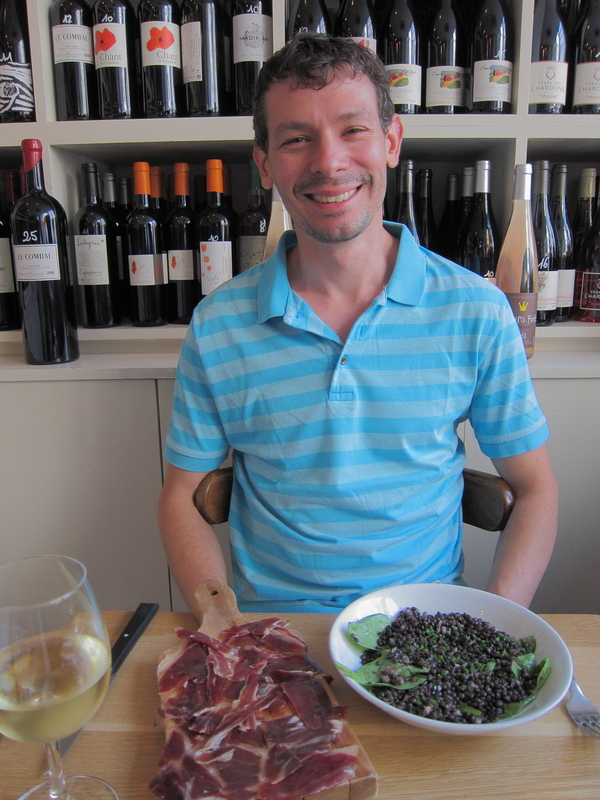 Friday lunch was with my Harvard friend Elliot Marks, at a wonderful little restaurant in his quartier, Tintilou. The meal was delicious and the service and ambiance were delightful. A new favorite! Elliot Marks at Tintilou, with the utterly delectable appetizer. 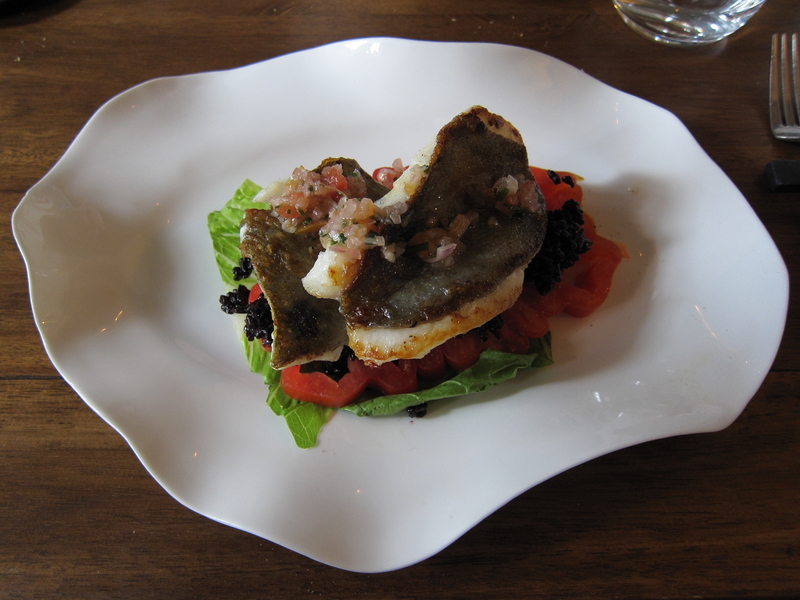 My main course at Tintilou: St. Pierre, which Elliot explained is called “John Dory” in English. 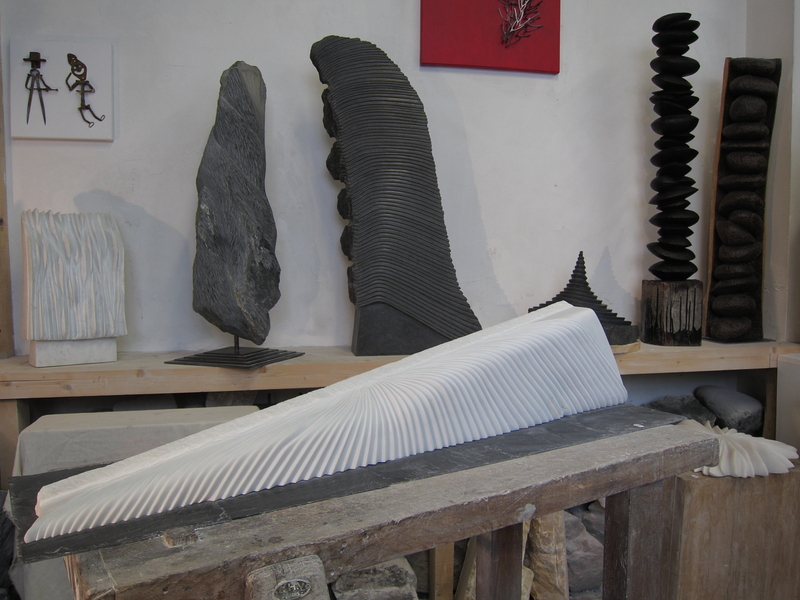 Sculptures by Catherine Arnaud at Belleville Portes Ouvertes 2015. The piece in the upper left corner was her reaction to the Charlie Hebdo murders. I also saw part of a very strange art show. 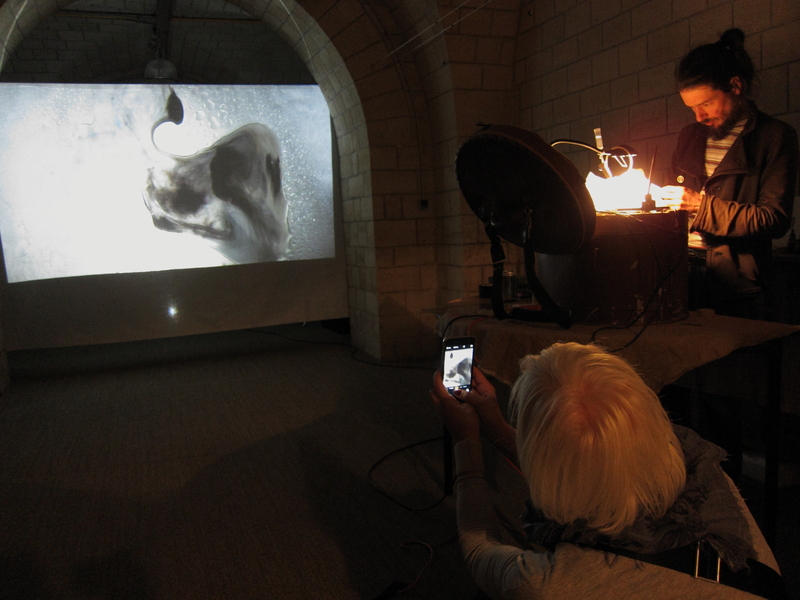 The artist dripped and mixed water and ink on a glass plate, which projected on a big screen. It was unusual, but I had to stifle the question, is it art? Art performance as part of Belleville Open Studios. By Stefano Giorgi? For dinner I caught up with another Harvard friend, Bob Seeman. The plan was initially for a tête-à-tête but he called earlier in the day to ask whether several of his visiting friends could join us. Of course I said it was fine, and we had a very pleasant meal. It was my first time at Le Colimaçon, though I had tried unsuccessfully to get a table there with Brian and Sheila the previous week. We all enjoyed our meals and the service, by several petite young women, was sympa. It’s a small space, with an impressive spiral staircase up to the étage (which Bob explained is called a colimaçon). Overall I consider it quite a reasonable option, although not a must. Matt had received an ominous call from American Airlines saying that their flight had been overbooked and asking whether they would they agree to be bumped to a different flight. It turned out, however, to be Christmas in May! The flight they had booked required a connection, and got them in very late on Saturday night, but the new flight was direct and got them here at a reasonable hour in the morning. Moreover they were offered a king’s ransom in cash to make the change! It was very much win-win (except for American) so they made the change and arrived early. 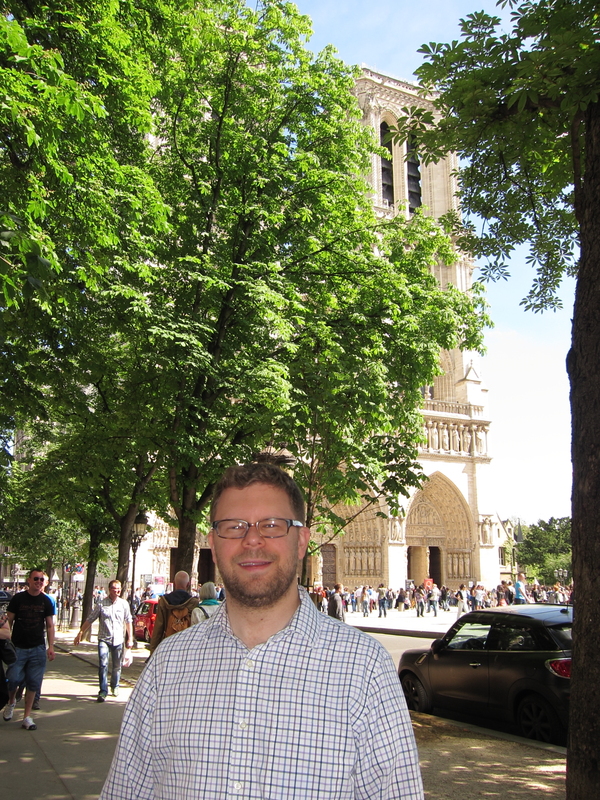 I took them on a walk through my neighborhood and over to the Marais, then via Notre Dame to the Latin Quarter. It was their first time in Paris so everything was a thrill, and as usual it was my pleasure to see the city anew through their eyes. 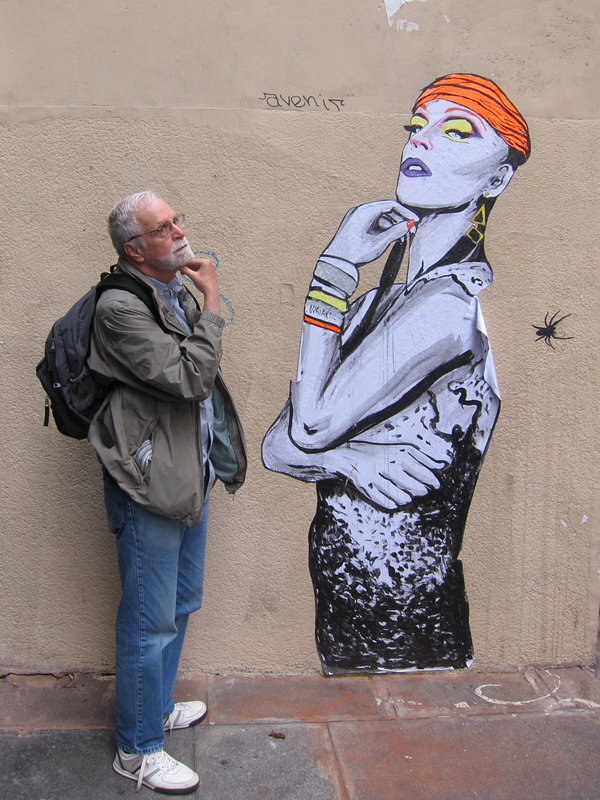 Bob and his new bff, rue des Jeûneurs. 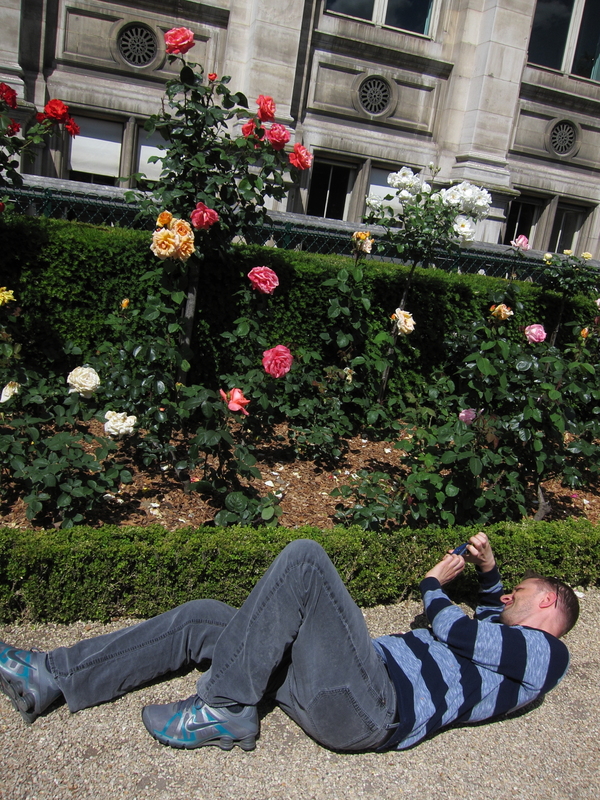 Matt getting an angle on roses in the newly-opened garden of the Hôtel de Ville. Chris with Notre Dame peeking shyly through the trees. We strolled around my neighborhood, then over to the 10e. The first restaurant we went into looked ok from the outside but was completely dead inside, and after we were seated we saw that the menus were tattered. We debated how to handle this and finally we just walked out and I explained to the proprietor that we wanted a more animated place. 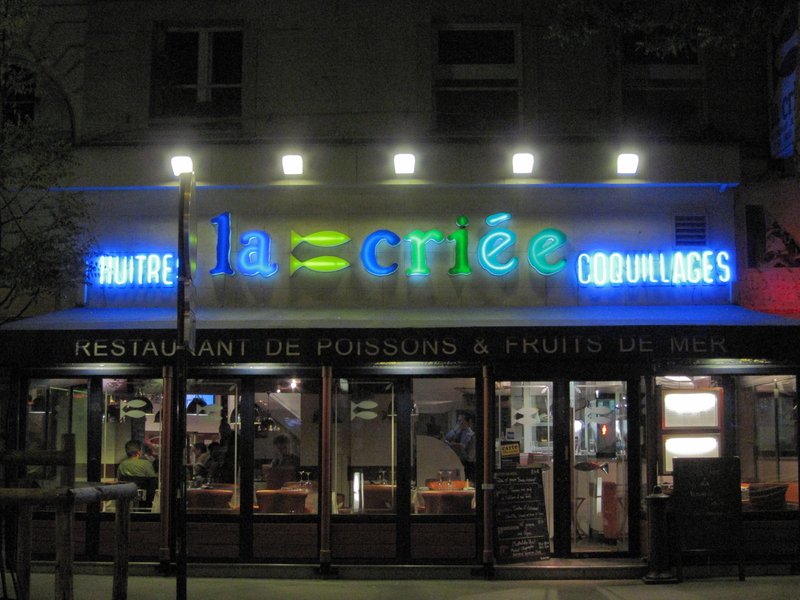 After a bit more persistence we ended up at a zippy and tasty fish restaurant, La Criée. La Criée on Boulevard de Bonne Nouvelle. Chris doesn’t like fish, so we confirmed before going in that they had a couple of beef dishes on the menu. Unfortunately, after Matt and I had exulted over the delightful seafood choices, and ordered, the waiter told us that there was no beef. (He wasn’t even apologetic; he said with a shrug (in French), “This is a seafood restaurant!”) Chris graciously ordered a cheese salad instead of a real main dish. It was a fine meal — for me and Matt — in a busy and bright space. 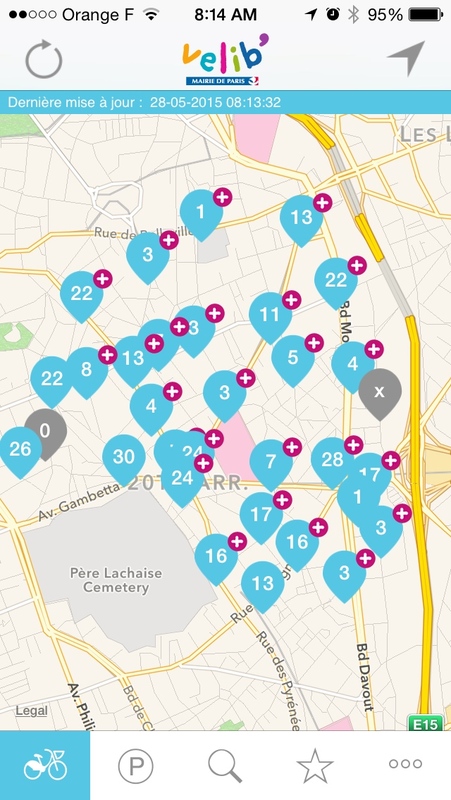 You always hear about the seven hills of Rome but what about the seven hills of Paris? 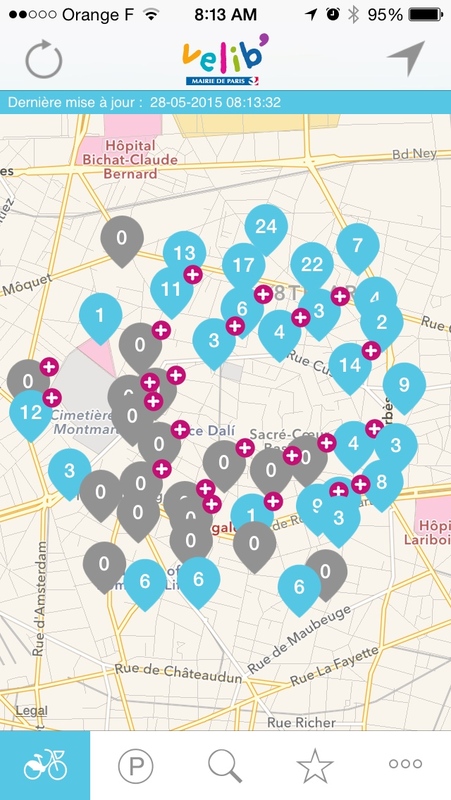 This reports on my scientific study of the Parisian hills, based on the Vélib’ bicycle sharing system. High-elevation Vélib’ stations are designated with a “+” sign, indicating that you will get a credit if you ride a bicycle up there from a lower-elevation station. This is important because the natural tendancy is to coast down but not struggle back up. 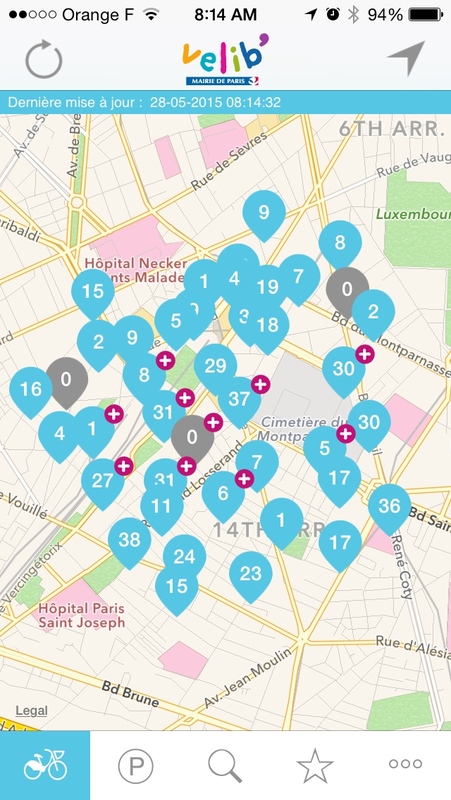 The Vélib’ iOS app shows the location of all stations, et voila ! Montmartre: 130 m (425 ft), north. Notice all the empty “+” stations. Maybe they need a “++” category for this steep hill. Montagne Sainte-Geneviève: 61 m (200 ft), south, around the Panthéon. Butte-aux-Cailles: 62 m (203 ft), south, near Place d’Italie. Montparnasse: 66 m (217 ft), southwest. The Arc de Triomphe is on a little hill, though I couldn’t find its name; west. There are, of course, less rigorously scientific ways of categorizing the Paris hills, such as this Wikipedia item: Topography of Paris. When you visit a place for only a few days, especially for the first time, it’s natural to want to see and do as much as possible. At home, in contrast, we typically follow comfortable routines. For better or worse my stays in Paris increasingly feel like being at home rather than being dazzled by contact with a new environment. The difference was particularly noticeable this year since I started off as a first-time tourist in Rome and Venice. My arrival in Paris was fun and pleasant, but also familiar and cozy. Actually more like being in Boston than in Venice. This was inevitable, and isn’t at all unpleasant, but it does mean that I may have to look elsewhere for really challenging travel adventures. Still gorgeous this year, but has it possibly gotten a bit shaggy? 2016 Update: Quite similar to 2015, so perhaps it’s reached full maturity. 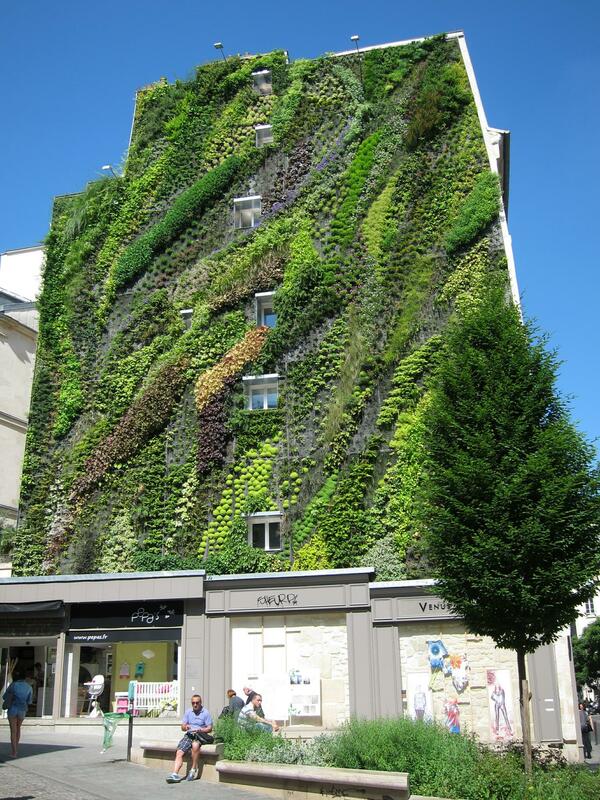 The concept of the Vertical Garden or Mur Végétal has become all the rage in Paris, and worldwide. Its creator and chief exponent is a botanist named Patrick LeBlanc. Walking around Paris is still fun for me, even when the sights have become familiar. 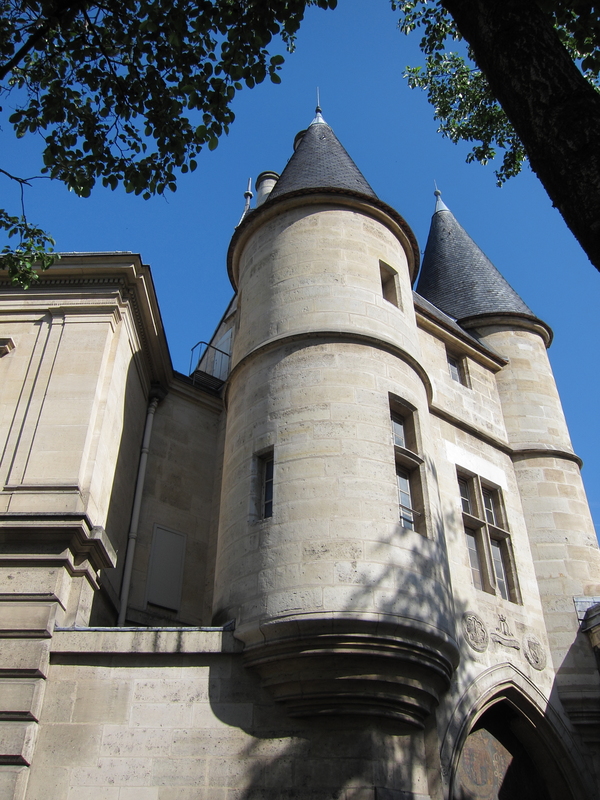 Medieval towers of the Archives complex along rue Vieux du Temple in the Marais. Last Friday afternoon I took a walking tour of lower Belleville, focusing on history and current cultural institutions. I chose the district because it’s trendy, and was listed as one of Fox News’s idiotic “No-Go Zones” after the Charlie Hebdo murders. I was impressed by the Théâtre de Belleville so I went back there on Sunday evening to see a play, Play House by Martin Crimp. It’s a wild and woolly work, very well realized by two talented young actors. I followed what was going on throughout — even when it was pretty crazy! — even though my French was only good enough for me to understand about half the sentences. I plan to go back to see another play there: Werther & Werther. By the way, whenever I’m interested in entertainment in Paris I first check the BilletReduc site. Usually there’s some savings, in this case 80% — the Play House ticket cost just 5 euros! I wandered down along the Seine after dinner and felt a desire for something sweet. I noticed the line of tourists waiting for ice cream … and bought a banana instead. 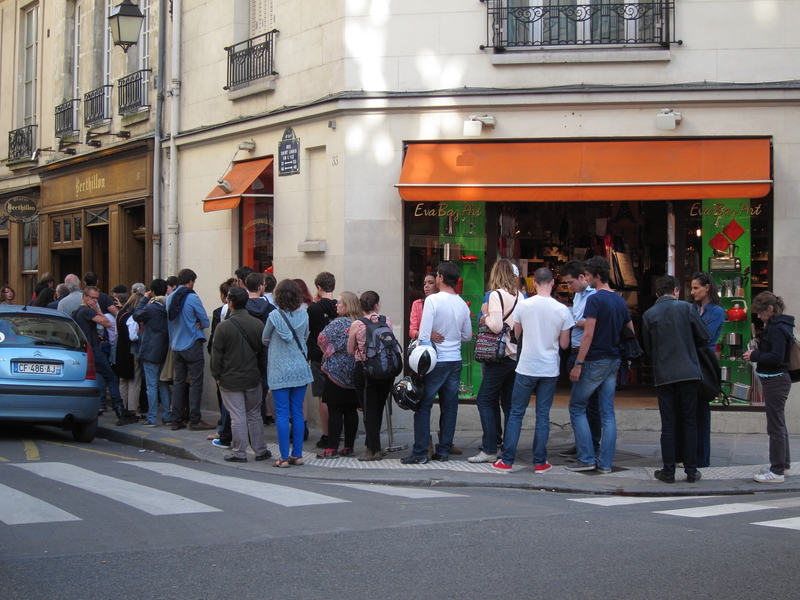 The line waiting for ice cream at Berthillon on l’Ile Saint-Louis. Mot du jour: balade – stroll, though often more specifically a guided walk. I’ve fallen behind! But it’s cloudy and cool for a change so I’ll do my best to catch you up on my Parisian adventures. Last Thursday I decided to visit the Albert Kahn museum and garden in Boulogne, a suburb at the end of the 10 métro line. 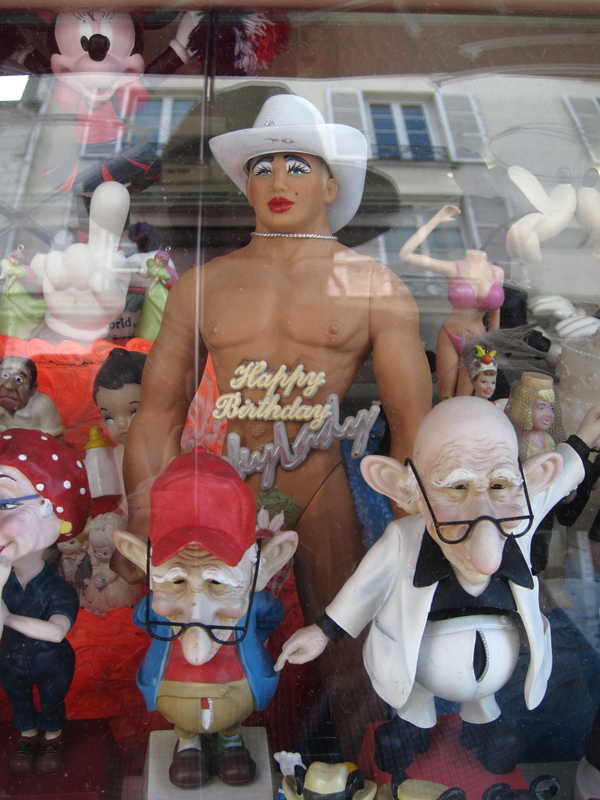 Apart from driving through in a rental car I had never been to Boulogne. It would have been a lovely day for Senlis or another An Hour From Paris day trip, but train schedules were still disrupted by the strike so it seemed best to stay within reach of the métro. Albert Kahn turns out to have been an interesting character. He made an enormous fortune as a speculator and banker in the 1890’s, then became a philanthropist, both as a donor and as founder of various projects designed to increase world peace and happiness. He never married, and the museum commentary takes pains to explain that his heart had been broken by a young woman in his youth, and that he maintained a secret mistress in later life. 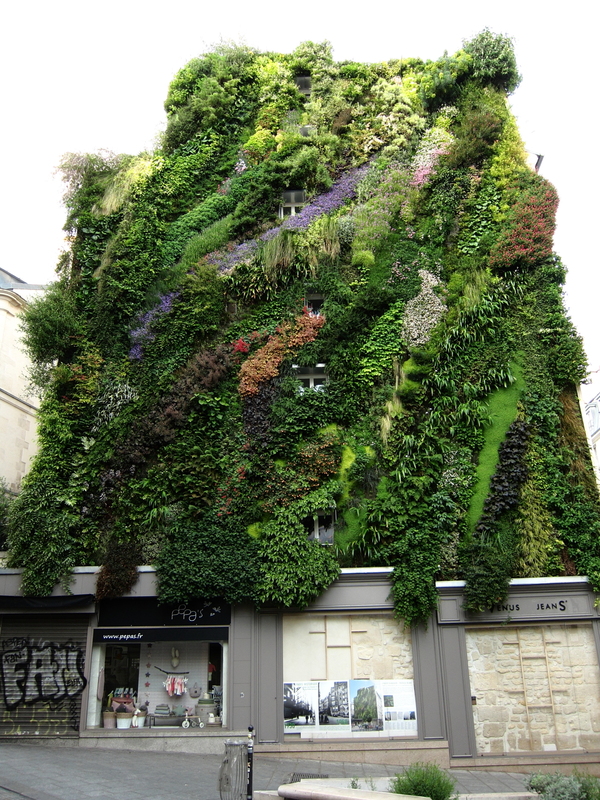 One of his eccentric projects was buying up dozens of parcels in Boulogne and turning them into a series of gardens – French formal, wild and natural (which the French call a jardin à l’anglaise), and Japanese. My favorite was the contemporary Japanese garden (a 1989 replacement for Kahn’s original version). 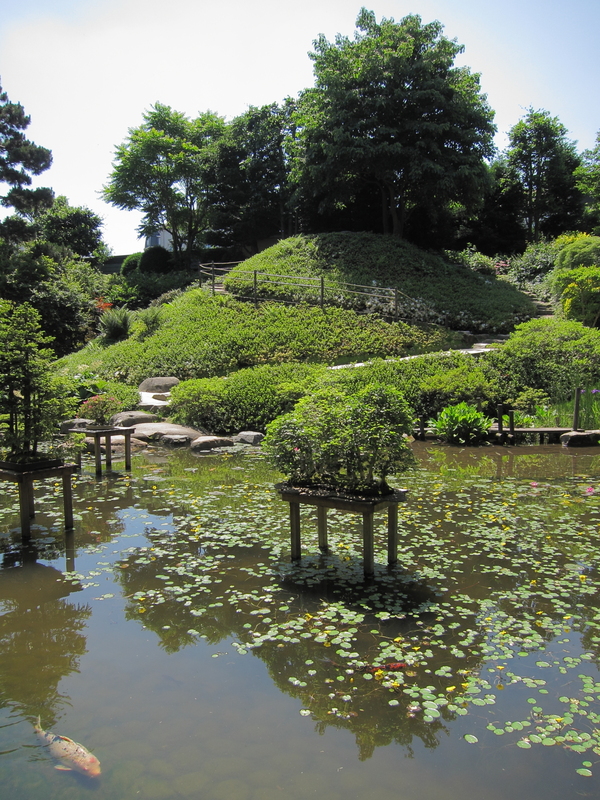 The Albert Kahn Japanese Garden in Boulogne, near Paris. I wouldn’t put the Kahn museum and gardens on a must-see list, but you can spend a few relaxing hours there. On Friday I finally caught up for lunch with Elliot Marks, a friend since his undergraduate days at Harvard who lives here with his French partner. We ate at a sort of deli-that-serves-food called Le Siffleur de Ballons. It was a casual and enjoyable meal. Elliot at Le Siffleur de Ballons. On Friday afternoon my friend Yunpeng arrived from Norway to stay with me for a long weekend. We had met on line several years ago, and had become comfortable with one another over Facebook, but this was the first time we had met in person. In retrospect this was quite a risk, but in this case it worked out beautifully. He had been to Paris once before so he had already seen the top tourist sites. This allowed me to guide him to some more typical and less touristy areas. 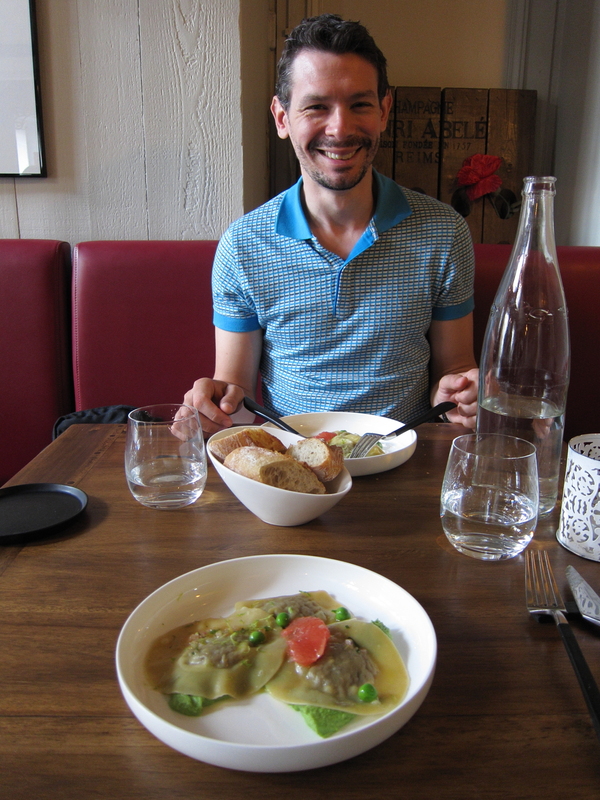 His first evening we ate at my old favorite Le Loup Blanc (which closed in 2014), which was as usual pleasant and good value for money. On Saturday we started with a look around the trendy Bastille quarter, then had lunch at Pause Café. 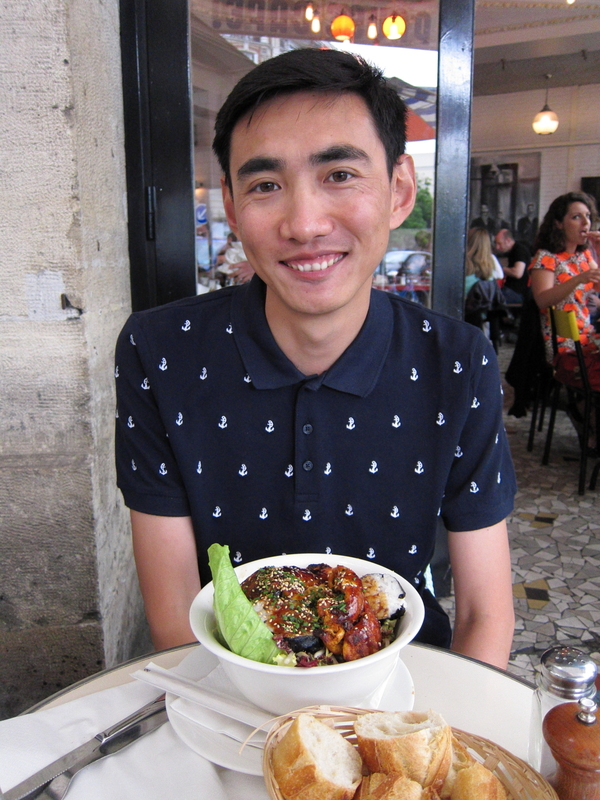 Yunpeng loved his Asian salad but my pan-fried salmon was just ok.
Yunpeng at Pause Café on rue de Charonne, Bastille. We strolled up to where the Canal Saint-Martin comes out of its tunnel, then (again!) over to my old favorite Montorgueil neighborhood, which was exceedingly lively. We had kirs at my favorite table on the terrace of the LB Café, which has a view down rue Tiquetonne as well as up and down rue Montorgueil. 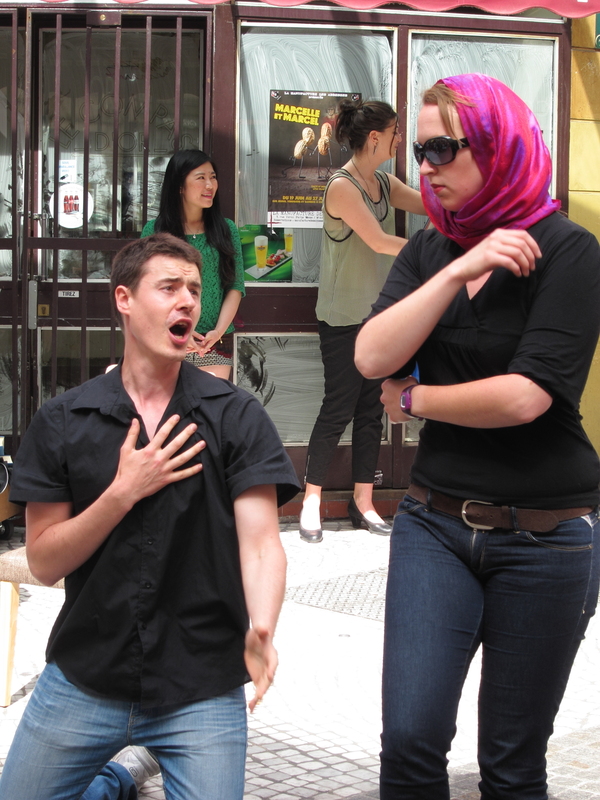 An aria from The Marriage of Figaro on the terrace in front of the (now closed) Compass d’Or on rue Montorgueil. 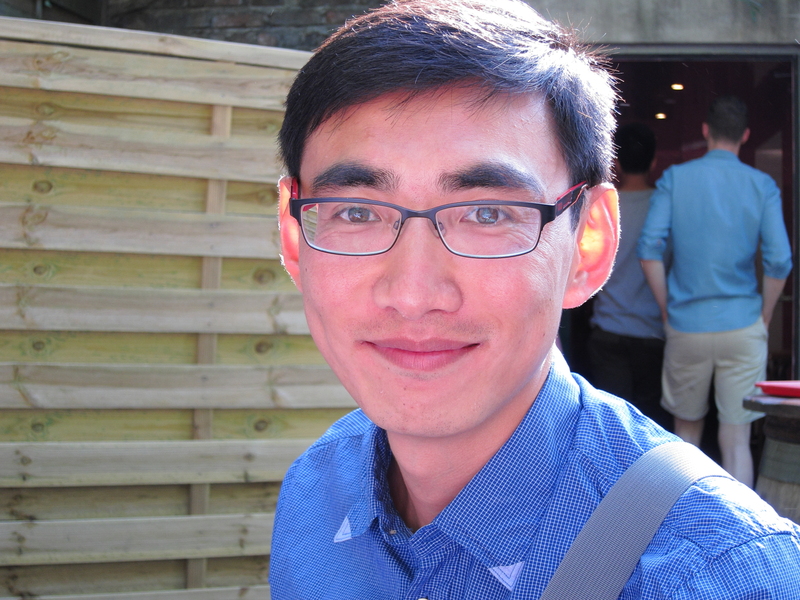 Yunpeng is from China but there is no good Chinese food in Bergen, Norway, where he is working on his PhD. Consequently, he had a hankering for a really good Chinese meal. Based on online reviews we ate on Saturday night at a Szechuan restaurant, Deux Fois Plus de Piment (“Twice the Spice”). Yunpeng enjoyed ordering in Mandarin Chinese, and to cater to my tender palate he requested spiciness level two on a scale of one to five. That worked out well for me, but Yunpeng, who is from northern China, found the food too spicy! On Sunday morning we had an impromptu picnic at the parc de la Villette. My plan had been to take a leisurely stroll from there over to the parc des Buttes-Chaumont, but it was chilly in the wind so we took the métro home again for more clothing (which as it happened we didn’t need). 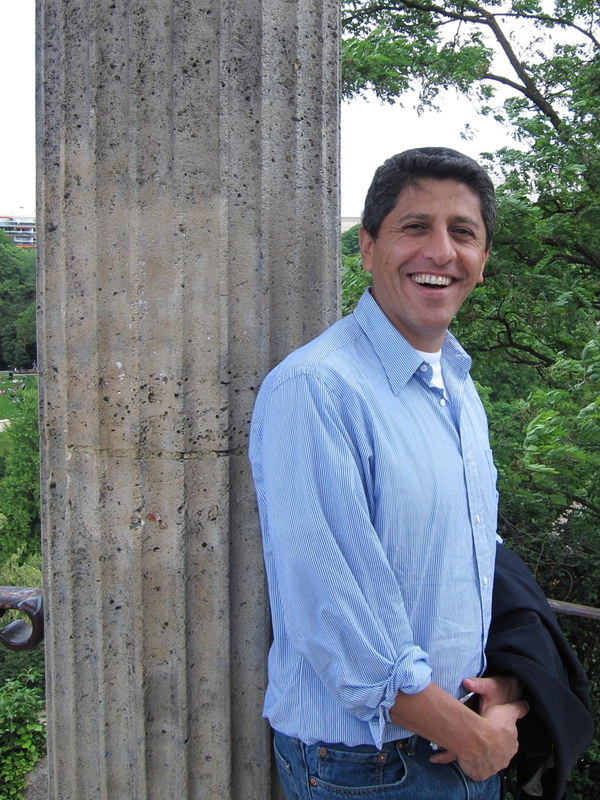 My Boston friend Mustafa joined us — one of the “expected surprises” of this year’s sojourn — and the three of us set off for the parc des Buttes-Chaumont, and the Sunday afternoon scene on the terrace of Rosa Bonheur. Mustafa at the temple de la Sibylle, in the parc des Buttes-Chaumont. 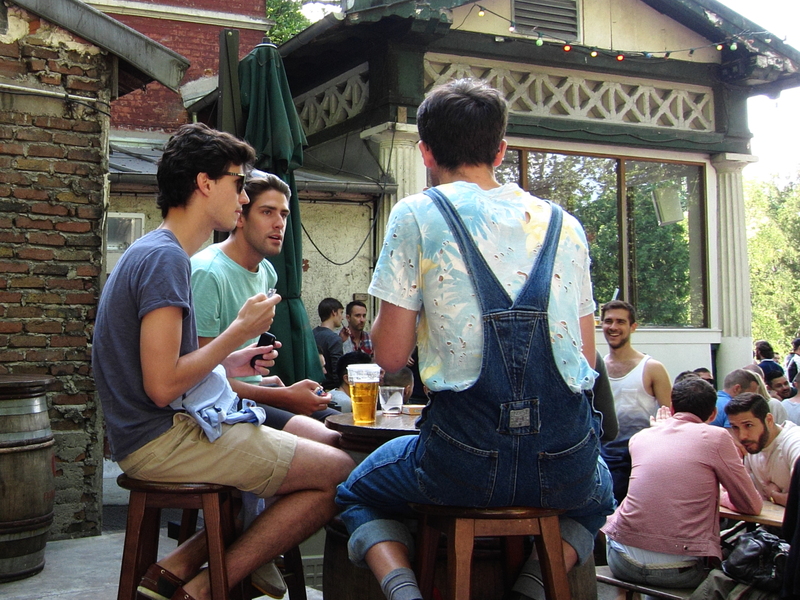 Handsome young men at Rosa Bonheur. 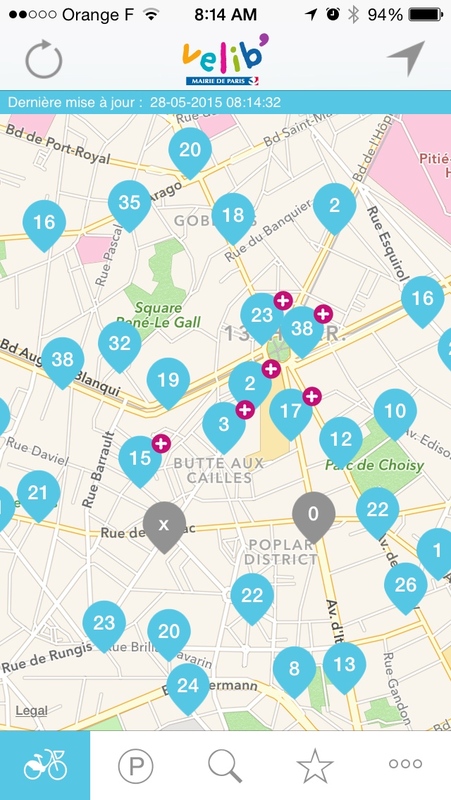 After a bottle of rosé and various other beverages we shared a nice, casual meal at a neighborhood French restaurant, La Pelouse, which has the great advantage of being right outside the park, at the Botzaris métro. Yunpeng left on Monday morning, after a lovely visit. That evening Mustafa and I went to a concert at the Opéra de Paris at Bastille. It’s a stunning 1989 building, and the theater itself offers excellent sight lines, even for the (relatively) cheap seats in the second balcony that I had reserved. My favorite piece was La Valse by Ravel. I knew that following Bizet French music had emphasized tonal painting rather than traditional melody, but I hadn’t appreciated how radical Ravel was. This piece toys with and demolishes the very idea of a waltz. It was too hot even for Diaghilev! I’ve been working on a project which I’d like to invite you to have a look at. I took a dozen photos of historic paintings when Jason and I toured the Musée Carnavalet a few weeks back. Since then, in my spare time I’ve been taking photos of what the same scene looks like today. The resulting pairs of photos are in this Google+ album: Paris Then and Now. Some scenes are almost identical, others very much changed, but I enjoyed the excuse to explore this lovely and historic city. One of the paintings I couldn’t match was on Passage Piat in the diamond-in-the-rough neighborhood of Belleville. I was comforted, as I walked up a slightly sketchy street, to see a police station in the next block. My comfort level was somewhat reduced, however, when I noticed that there were bullet holes every few feet in all of its windows! Belleville police station, with bullet holes every few feet in each of its windows. Mot du jour: décapsuleur. For once your guess would probably be correct.